Make your Pattaya travel plans easier with what you're about to discover. 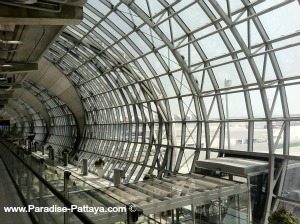 When you arrive at the Bangkok Airport you will be jet lag and probably tired. You don't want to deal with the street touts at the airport! Get this part of your trip handled and your vacation will start out smoothly. Enjoy the feelings of anticipation as you inch closer to your hotel. This is a much more vitalizing way to start your trip - so let's get to it! What are your 3 most recommended options for getting there? The Air-conditioned Bus that saves you money, is reliable, and a treat after your flight. This is the most convenient direct air-con bus service between Bangkok Suvarnabhumi Airport and Pattaya and vice versa. When you arrive at the airport, baggage claim is on level 2. The bus will be at level 1. The AirCon Bus and staff will be waiting for you on Level 1, Gate 7 next to the Tourist Police counter. 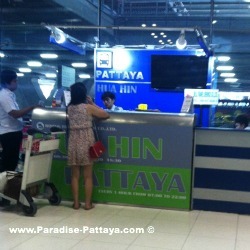 The staff will be holding a sign Pattaya - Bell Travel Service. You will have to register on their website. When you're done you'll recieve a sample confirmation like the one my friend George got. If you prefer you can also call Bell Travel Service to make a reservation +66(0)86-345-8441 and +66(0)86-345-8442. 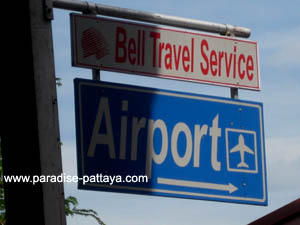 Pattaya Travel with Bell Travel Service will give you the most comfortable option, at the best price. What's another good way to get to Patts? 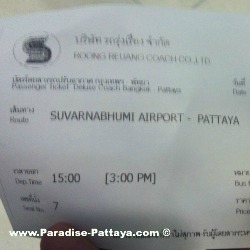 The ticket for a one-way trip is 150 Baht or $5 per person at the time of this writing. This is the best deal and it's a great service. The bus travels a non-stop direct route on the motorway, and takes approximately two hours for the 127-kilometer trip to Patts. Minibuses will be waiting at the drop off location and these will take you to your Hotel in Pattaya. This service is included. The fastest way to get a taxi is to go to level 4 and grab a taxi that is dropping passengers off. If a lot of flights arrived you probably have to stand in line at the arrival level in order to get a taxi. The taxis will be on arrival level, which is level 2 where you come out, and they are located between exit door 3 and 4. There is a desk and they give you a ticket for a taxi. Their service is excellent and reliable. Click on the link above to read about their taxi service fome Bangkok Airport to Pattaya and visa verse. You can also email them from that page if you want to book a taxi with Mr.T Taxi. Phone numbers are provided as well. Your Pattaya Travel Plans made easy and trouble free. "Whats Your BKK Airport To Pattaya Travel Experience Like?" If you have good or bad experiences with any of the services I promote on this web page, please let me know by emailing me. I do not earn commissions from these 3rd party providers. This is a free service I provide, but I need feedback in order to promote only the best service providers on this Web Site. Other Travellers would really appreciate that too. Looking for a Guesthouse/Hotel close to Bangkok Airport?